Office 365 - save money with Office you already have. Office 365 gives you Office that you have always been using but with much greater power. Get Outlook Web Access with the familiar interface, Outlook and files sharing capabilities inside and outside the organization, document editing online, real-time collaboration, conferencing and much more. Office 365 is a subscription based joint cloud service, featured with email, Office suites, file sharing and many other opportunities. It is the same Microsoft Office that you all are familiar with and use every day, but it is now empowered with easier communication and collaboration with others. Microsoft brought everyday work life to a whole different level with Office 365 cloud. The essential aspect of Office 365 is flexibility. Tools and services are not tied to a single PC anymore. You can access your Outlook email, calendars, edit Office files or chat colleagues from virtually anywhere: work or home PC, laptop, tablet, smartphone. Besides, you can get the latest Office Professional Plus with plans for enterprises. All these features without a doubt have become the core qualities of any successful business, no matter if we are talking about a small family business or an enterprise. Already decided to migrate from Microsoft Outlook to Office 365 - use free migration tool. 4Team Corporation has been certified Microsoft Golden Partner for more than 10 years. Seamless, instant and complete Microsoft Outlook synchronization. Set up your email account on multiple devices and sync Outlook between devices automatically. Your email, no matter if accessed via Web App or desktop app on any of your devices, will look exactly the same as you left it working last time. Sync not only email, but read/unread statuses as well. Calendars, contacts, tasks, categories, groups, folders, etc. - everything will be in sync and easily accessed via desktop app or Outlook online. Work online or offline. Access email, calendar and contacts from anywhere. 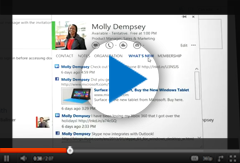 Full web access of your email and documents saved in the cloud with Office Web Apps. All you need is internet and a browser. Be able to reach all the information you need no matter if you are at work, at home or on the run. Don’t limit yourself any more by spending all your time at the desk with Microsoft Office online. Set up Office 365 on a smartphone or a tablet and access your email, documents and other Office 365 services no matter where you are. You don’t have to sit at your computer all the time in order to be able to solve problems, edit documents or attend an online meeting. File sharing and easy collaboration with colleagues. Share files and folders with your colleagues and co-workers. Publish your files or folders and make them accessible to your team, allow them to edit and comment the documents to avoid sending it back and forth. Create private and public websites. Instant messaging and online conferencing. Group communication. Chat, have voice calls or video conferences with your colleagues. Invite people to attend online meetings directly from Outlook. Scheduling is made simple with integrated free/busy information. Join conversation with one click from Outlook. Synchronize Microsoft Outlook data with multiple sources: iCloud (iPhone, iPad) , Google (Gmail, Android), Microsoft Exchange (Office 365). Sync2 Cloud Synchronize Microsoft Outlook data with multiple sources: iCloud (iPhone, iPad) , Google (Gmail, Android), Microsoft Exchange (Office 365).